The actor Narumi Goroshirô I held this name from the 11th lunar month of 1716 to the 11th lunar month of 1758. Dates of birth and death unknown. Disciple of Nakamura Shichisaburô II, his first stage names were Nakamura Shichitarô and Nakamura Tomojûrô (received in 1769). 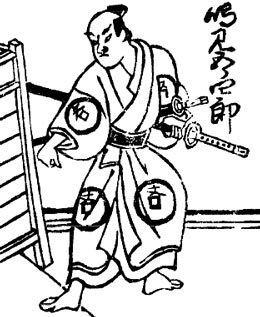 He became katakiyaku and took the name of Narumi Goroshirô II in the 11th lunar month of 1779, playing at the Nakamuraza the role of Yuasa Magoroku Nyûdô in the kaomise drama "Kaeribana Eiyû Taiheiki", which celebrated the shûmei of Yamashita Mangiku I. He was active in Edo up to 1794.